V.O.A.T. 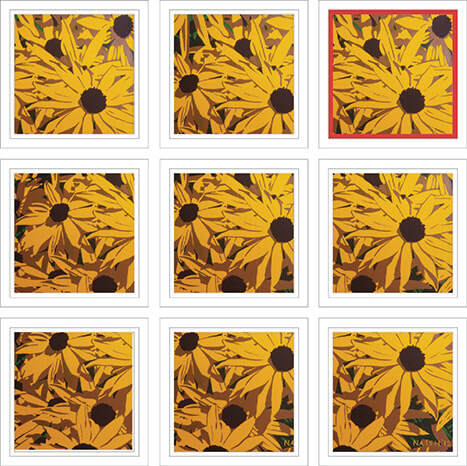 Top Right or “Variations on a theme (top right) if you prefer is a return to the series of Rudbeckia paintings which I began back in 2012 with “Yellow Burst”. Indeed, it is a copy of “Yellow Burst: Six Colours Remix” from the same year. The difference is that I’ve used a 20cm x 20cm segment of the original 30cm square canvas. 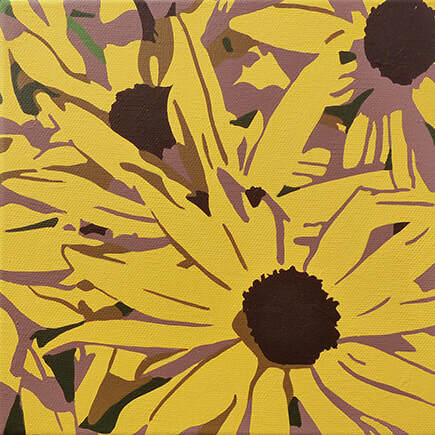 One of a series of nine paintings, each will be a different part of the original’s canvas. The resultant composition is therefore chosen through maths rather than aesthetics. The nine paintings together are inspired by the “Canvas Size” dialogue box in Adobe photoshop. Doing a one man show at the Eagle is a rare opportunity to exhibit these nine pieces as normally one can only exhibit two works in a group show. The pieces were produced in the evening work slot in much the same way as was the case for “Cacophony Divided”. I like the idea that seeing a single artist’s work all together in one place leads to the old do I like this one or that one argument. Sometimes when one “orphans” a piece and takes it home it loses some strength from being with connected material. Even more so with these nine related works. Each sold separately – will they ever exist in this way again? Is the meaning lost too? – or is it but a pretty yellow pattern? Position of piece when first exhibited.